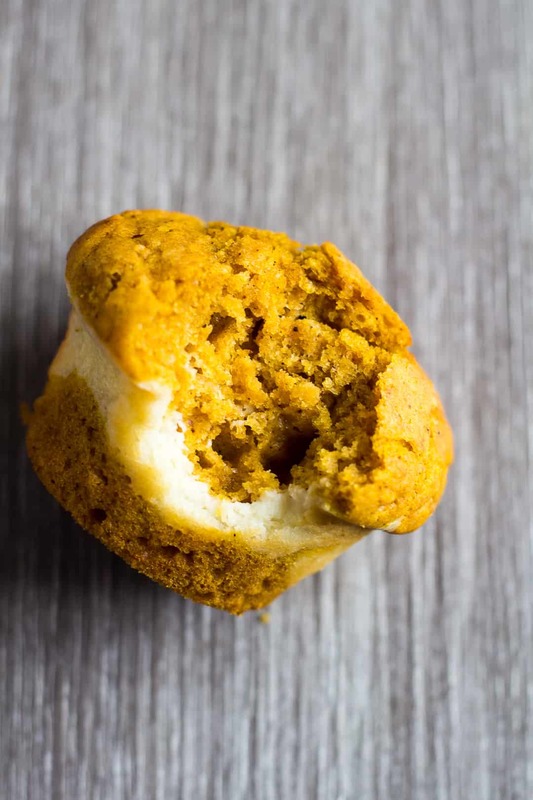 Pumpkin Cream Cheese Muffins – Deliciously moist and fluffy pumpkin muffins that are stuffed with a creamy cheesecake layer. Perfect for those cooler autumn mornings! 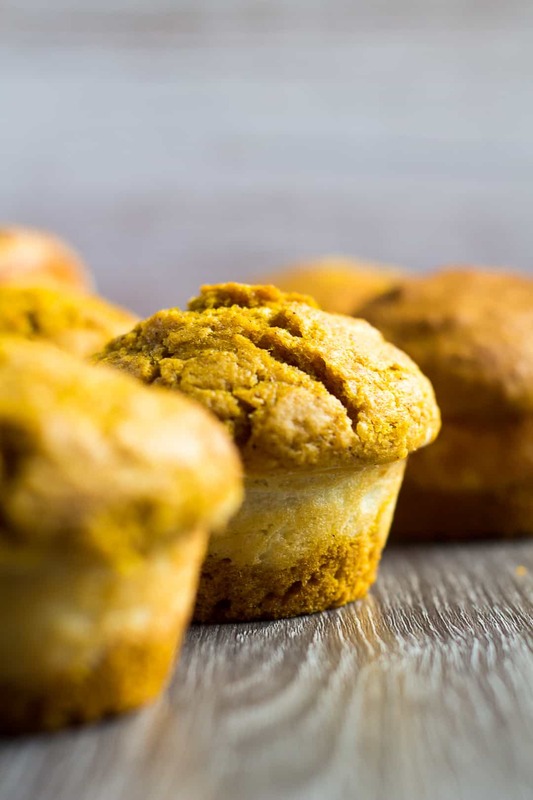 I originally brought you these delicious pumpkin muffins back in September 2016, and recently I have been tweaking the recipe so I can bring you all a new and improved version. 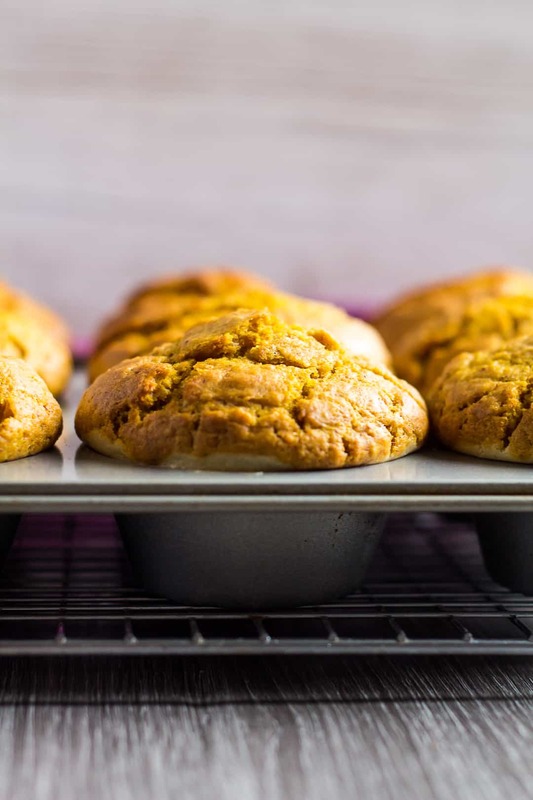 These bakery-style pumpkin muffins are moist and fluffy, deliciously spiced, and stuffed with a cream cheese layer. I love to enjoy these warm on cold, autumn mornings! Buttermilk: See my recipe notes below on how to make your own buttermilk! 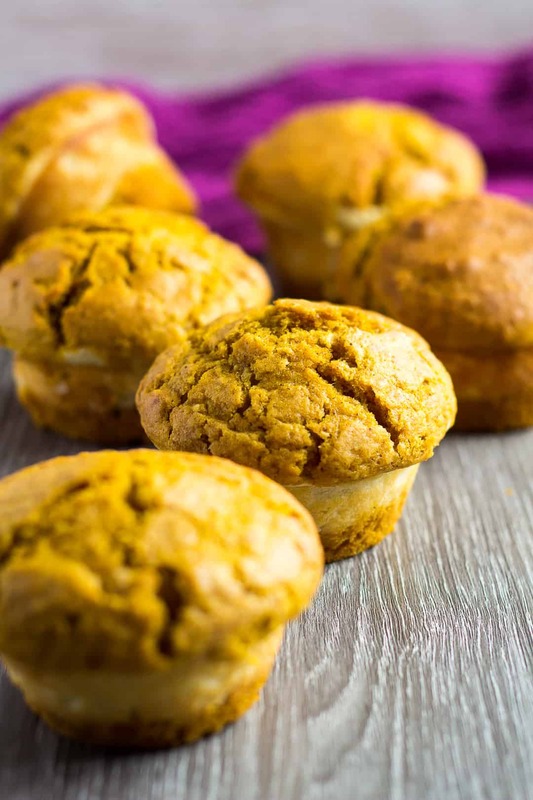 To make these muffins, simply whisk together the flour, sugar, baking powder, baking soda, salt, and spices. Set aside. Whisk together the egg, buttermilk, oil, vanilla, and pumpkin puree. Add to the dry ingredients and mix until just combined. For the cream cheese filling, whisk together the cream cheese and sugar. Add the egg and vanilla, and mix until combined. Mix in the flour. Spoon the muffin batter into a greased 12-hole muffin pan, filling only 1/4 of the way. Add 1 – 2 tablespoons of the cream cheese mixture, then top with the remaining batter. Bake for 18 – 20 minutes, or until a toothpick inserted into the centre of the muffins comes out clean. Allow to cool for 10 minutes in the pan before transferring them to a wire rack to cool completely, OR enjoy one warm! 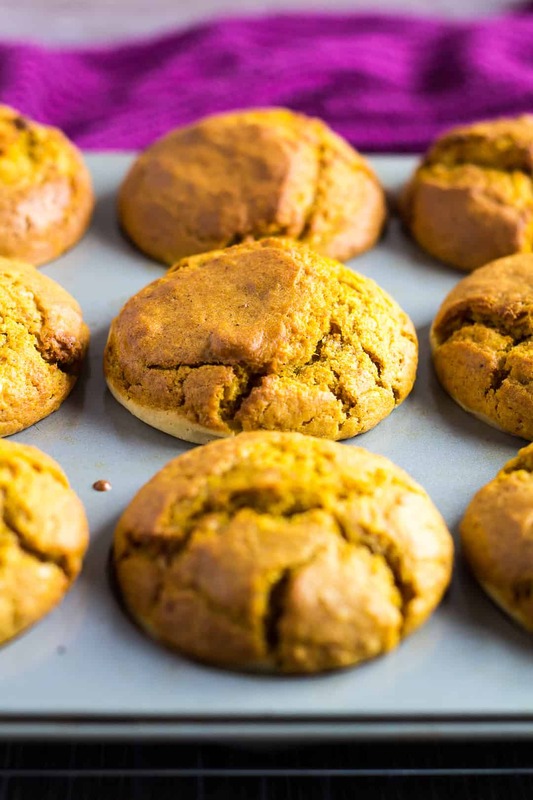 How long will these pumpkin muffins last? These muffins stay fresh in an airtight container at room temperature for up to 3 days, or in the fridge for up to 5 days. 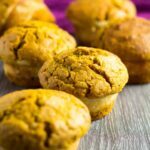 Can I freeze these pumpkin muffins? Yes! These muffins will freeze well for up to 3 months. Thaw overnight in the fridge before serving. More pumpkin recipes to try next! 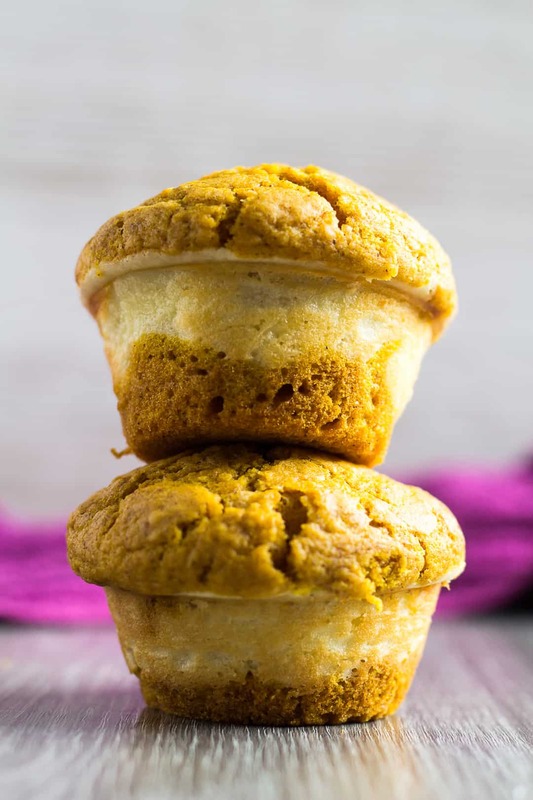 Pumpkin Cream Cheese Muffins - Deliciously moist and fluffy pumpkin muffins that are stuffed with a creamy cheesecake layer. Perfect for those cooler autumn mornings! Whisk together the egg, buttermilk, oil, vanilla extract, and pumpkin. Pour the wet ingredients into the dry ingredients, and mix until just combined. Do not over-mix. Whisk together the cream cheese and sugar until combined. Beat in the egg and vanilla, then mix in the flour. Spoon the muffin batter into the prepared pan, filling only 1/4 of the way. Add 1 - 2 tablespoon of the cream cheese mixture, then top with the remaining batter. Bake for 18 - 20 minutes, or until a toothpick inserted into the centre comes out clean. Allow to cool for 10 minutes in the pan before transferring them to a wire rack to cool completely. *To make your own buttermilk, simply measure out 1 cup (240ml) of milk, and stir in 1 tablespoon of lemon juice or white vinegar. Let stand for 5 - 10 minutes until the mixture starts to curdle, then it's ready to use! Muffins stay fresh in an airtight container at room temperature for up to 3 days, or in the fridge for up to 5 days. They also freeze well for up to 3 months. Thaw overnight in the fridge. This is exactly what I’m craving right now! I am in full on Fall baking mode and am definitely going to have to try these. Love this recipe! These look decadent, gorgeous pictures too! Perfect recipe for autumn! I just love the filling and the streusel – what fantastic combination of flavours and textures! Goodness, these look fantastic! Love that layer of cheese cake in between!! I’m so ready for pumpkin season! These look so amazing! Perfect recipe for autumn. i’ll try this out for my family’s picnic this weekend. many thanks for sharing, Masha. muffins are always my favorite. Thanks, Pat! I hope you enjoy! I need to substitute the oil for apple sauce. How much applesauce? Thank you so much….so no oil just the applesauce; right? Also will they still be moist? Thanks so much. Hoq much is 1 cup cream cheese if I buy an 8 oz brick. Yep, just the applesauce, no oil. The muffins should be moist with applesauce too. 1 cup of cream cheese is 8oz 🙂 Enjoy! These look wonderful, what can I use instead of the buttermilk? Thanks so much in advance. Hi Jenny, in my recipe notes I let you know how to make your own buttermilk 🙂 If you’d rather not, you could use whole milk, but I highly recommend buttermilk.